The Pair Match Window allows you to join two tables together side-by-side, aligning rows by matching values in some of their columns between the tables. It can be obtained using the Pair Match ( ) button in the Control Window toolbar or Joins menu. In a typical scenario you might have two tables each representing a catalogue of astronomical objects, and you want a third table with one row for each object which has an entry in both of the original tables. 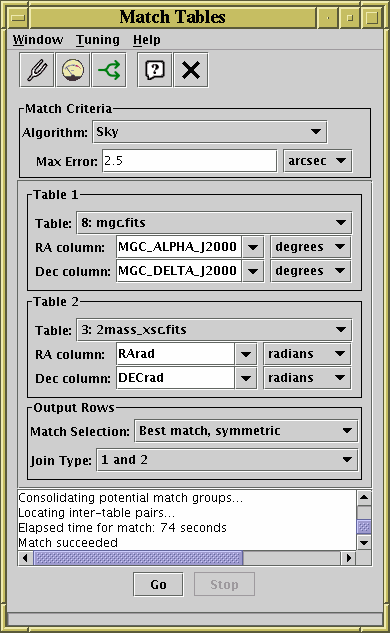 An object is defined as being the same one in both tables if the co-ordinates in both rows are "similar", for instance if the difference between the positions indicated by RA and Dec columns differ by no more than a specified angle on the sky. Matching rows to produce the join requires you to specify the criteria for rows in both tables to refer to the same object and what to do when one is found - the options are discussed in more detail in Section 5.2. The result is created from the Apparent versions of the tables being joined, so that any row subsets, hidden columns, or sorts currently in force will be reflected in the output. Progress information on the match, which may take a little while, is provided in the logging window and by a progress bar at the bottom of the window. When it is completed, you will be informed by a popup window which indicates that a new table has been created. This table will be added to the list in the Control Window and can be examined, manipulated and saved like any other. In some cases, some additional columns will be added to the output table which give you more information about how it has progressed (see Appendix A.8.2.1. Allows you to select which tables are to be joined and which columns in them supply the matching coordinates. Allows selection of which rows are to be included in the output table (for instance whether only those rows matching in both tables should be output or not). Reports on progress as the match is taking place. The progress bar at the bottom of the window also provides an indication of how far through each stage processing has got.